The cost is $2,500 per student for a 6 week intensive on-the-water training including STCW. 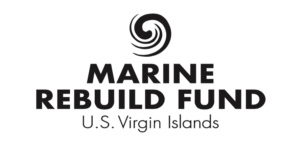 Donate to Community Foundation of the Virgin Islands and specify in the Paypal donation "Marine Rebuild Fund"
After the 2017 hurricanes VIPCA established a 501(c)(3) charity arm called the Marine Rebuild Fund (MRF) with the aim of boosting VI employment opportunities in the marine industry by repairing existing & developing future cruising grounds & creating marine education training/ development programs in the wake of the catastrophic 2017 hurricanes... MRF is fiscally sponsored by Community Foundation Virgin Islands (CFVI). 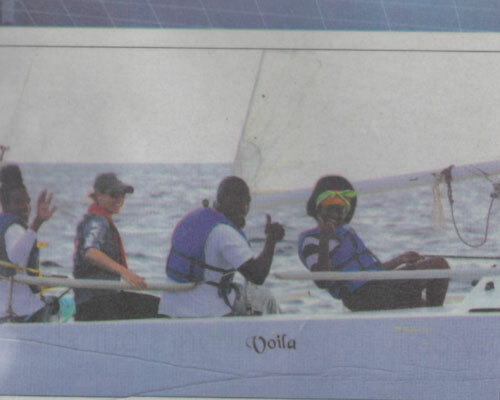 MRF funded this inaugural five week intensive “Marine Apprenticeship” which provided training in the marine charter industry to these young adults from St. Thomas and St. John in partnership with Cruise Ship Excursions. A mentorship and scholarship program will follow these apprentices to careers as captains and crew with VIPCA’s continued support of their careers being made successful in the Marine Industry. We are proud to announce that we are Sponsoring each student through a five-day STCW Basic Training (Standards of Training and Certification of Watchkeeping) worth $1200 per student. Breaking News! VIPCA has partnered with My Brother’s Workshop and created “My Brother’s Workshop – Marine” and there will soon be year-round MBW Marine Vocational Training provided for at-risk youth in marine maintenance services to complement the yearly 6 week Marine Apprenticeship program on the water. 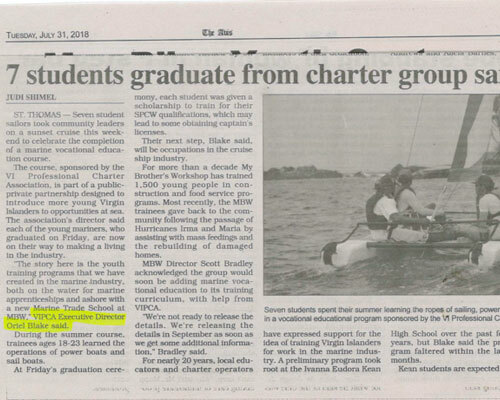 VIPCA will continue to seek funding through the Marine Rebuild Fund to continue train the Five Week Marine Apprenticeship every year, and we are proud to be now part of the Department of Education’s “Marine Academy” and look forward to continued work supporting and furthering the career prospects of students in Virgin Islands high schools in the Marine Industry.